I’ve been on a mission to create creamy, rich vegan chocolate ice cream, and it almost stumped me. My first attempt lacked depth of dark chocolate flavor. My second attempt came closer, but lacked creaminess. And my third attempt? Total winner. 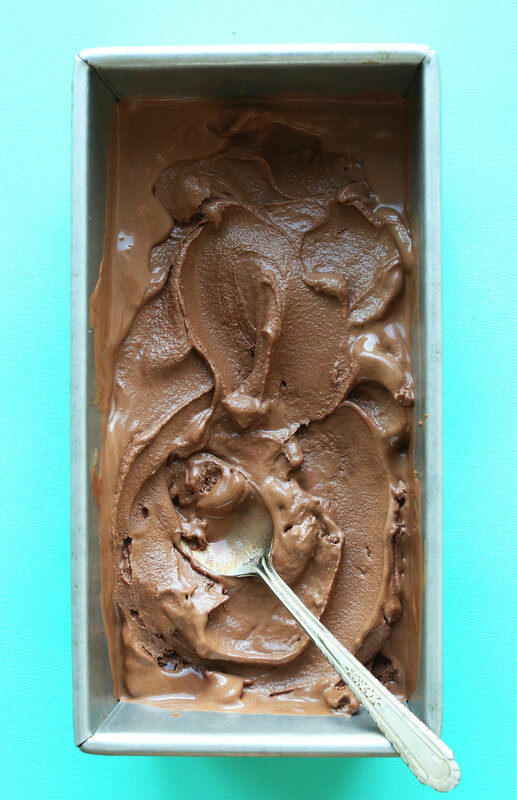 Creamy, insanely rich chocolate flavor that’s somewhere between ice cream and gelato. Get your ice cream maker, kids. We’re doin’ this. This recipe requires just 6 ingredients and simple methods. 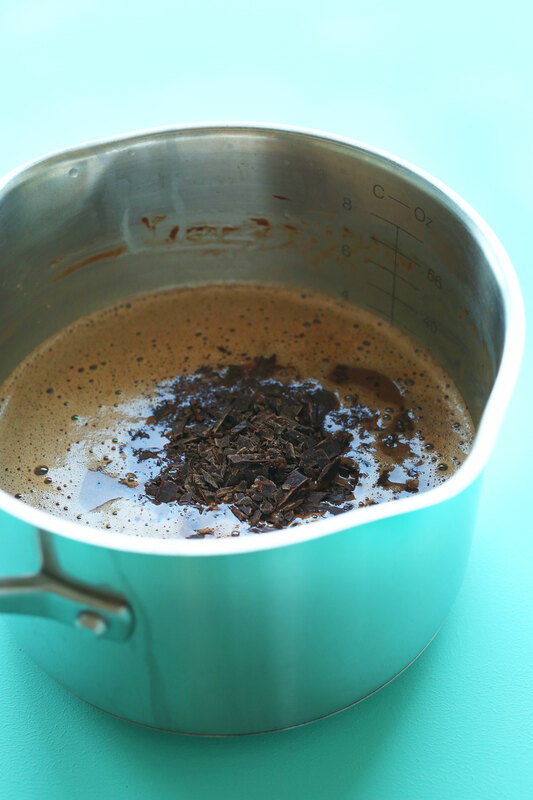 If you can whisk, blend, and pour into an ice cream maker, you can master this easy recipe. The base is comprised of water, cocoa powder, rich coconut cream, and organic cane sugar, which is whisked together. Then comes the deep chocolate flavor: from plenty of vegan dark chocolate. The last ingredient is vanilla extract, which enhances the flavor and helps prevent ice crystals (because of the alcohol content). Then simply blend, chill, and wait patiently until it’s time to churn. 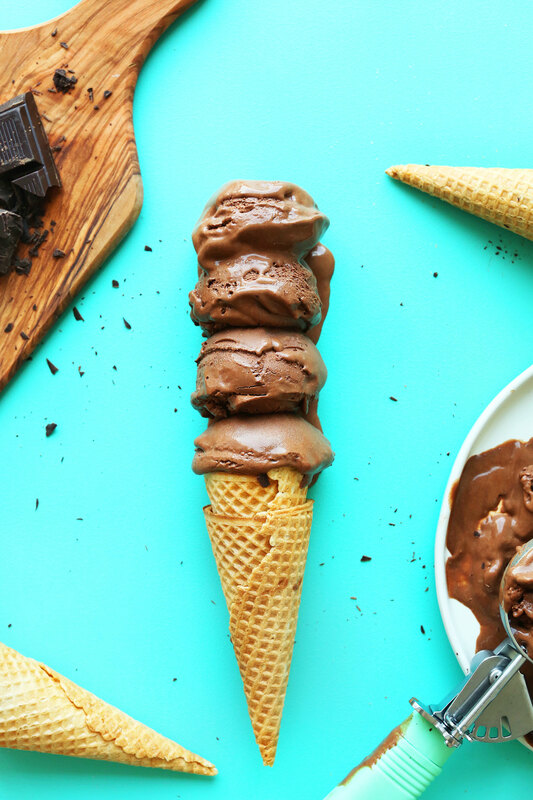 This ice cream is insanely creamy and so, so rich in chocolate flavor. It satisfied that craving I had for the chocolate ice cream I enjoyed back in my dairy-eating days. This will make the perfect treat to have on hand this summer for snacking or for hosting. I highly recommend serving this with fresh strawberries and coconut whipped cream. And whoops, what if a raw brownie falls in the bowl? Bliss. 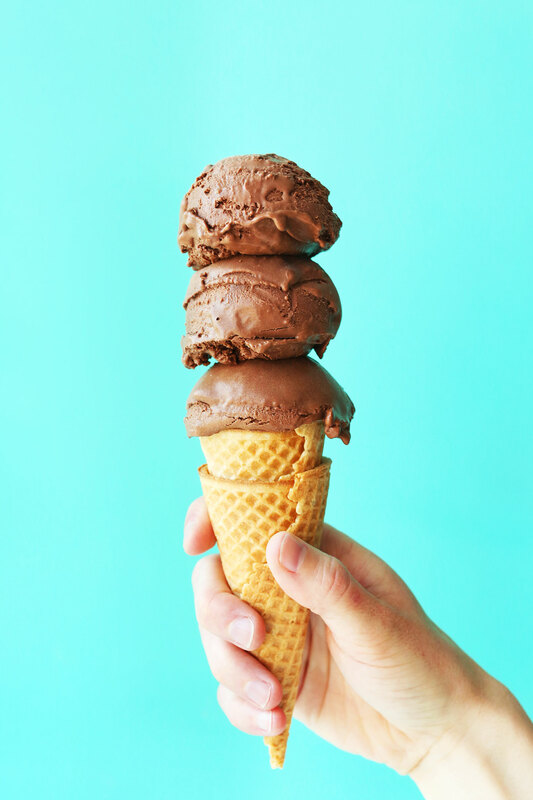 Creamy, 6-ingredient vegan chocolate ice cream infused with cocoa powder, vegan dark chocolate, and coconut cream. Simple methods, extremely rich, and satisfying results. The day before, add your ice cream churning bowl* to the freezer to properly chill. The same day, prepare your base. 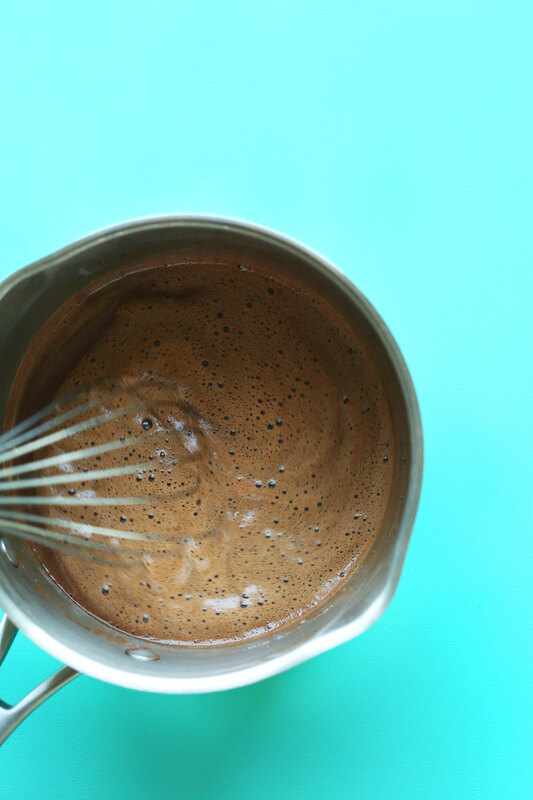 Add the water, cane sugar, coconut milk, cocoa powder, and salt to a large saucepan and whisk to combine. Bring to a low boil over medium-high heat, whisking frequently. Once it reaches a low boil, continue cooking and whisking for 1 minute. Remove from the heat and add the chocolate and vanilla. Whisk until melted. To remove any graininess, add to a blender and blend for 30 seconds on high. Then transfer to a mixing bowl and chill thoroughly overnight. The next day, add your chilled base to the ice cream maker and churn according to the manufacturer's instructions - about 30 minutes or until it looks like soft serve (see photo). Enjoy as sort serve, or transfer to a parchment-lined dish or loaf pan, cover securely, and freeze for 4-6 hours, or until firm. Let thaw 10-15 minutes before serving to soften. Use a hop scoop to ease scooping. Enjoy within 7-10 days. This is excellent with ripe strawberries and coconut whipped cream! *There's something magical that happens with sugar in this recipe, so I wouldn't recommend subbing it for maple syrup or coconut sugar, as it will likely lack creaminess. But, if you give it a try, let me know how it goes in the comments! *If you don't have an ice cream maker, you can still make this ice cream, but it won't be as creamy. Follow the instructions up until churning, and instead add it to a mixing bowl or loaf pan and cover with foil. Freeze for a total of 8 hours, and remove from the freezer once an hour to whisk/stir to incorporate air and prevent ice crystals. *Recipe loosely adapted from David Lebowitz. Since semi-sweet chocolate chips were what I had on hand and they don’t bother my brother, I used those. So, to make up for the sweeter chocolate, I also adjusted the sugar by starting with 1/3 cup and then adding a little more to taste. I also only chilled for 5-6 hours but it worked wonderfully. Ok, so is it just me or is the extremely rich refrigerated base perfect as a delectable pudding?? Btw, I’ve been on a quest to find an amazing chocolate vegan pudding and I do believe I just found it! I am churning as I write and the motor on my machine is really getting a workout. I followed all of your directions and I just want to be sure that your base (pre-churn) turned out quite thick as well…? Hi Christina, depending on the brand of coconut cream, it may be rather thick and pudding-like! It should still work great! Enjoy! Hi. I was wondering how this recipe compares with the date base chocolate ice cream. I’m looking for a whole foods ice cream recipe but without sacrificing flavor for my plant based whole foods cafe. Also might it be possible to sub coconut cream in vegan ice creepy making with fatty nuts instead like mac nuts? Thanks. Hi Sam, we aren’t familiar with that product and aren’t sure how it pairs. We don’t think fatty nuts will work quite as well as coconut cream, but if you give it a try, we would love to hear how it goes! I did the repice exactly as explained but with brown sugar instead of cane sugar. The texture didn’t look like ice cream at all, more like a pudding and it was very solid when I took out of the refrigerator. Any explanation for that? Thank you. Have a question regarding substituting coconut cream for soy milk. Would that work. Hmm I’m not sure as we haven’t tried it out. If you give it a go, report back. Good luck! I made this a few days ago. My non-vegan family and I have been loving it! I used coconut milk and only a little less than a half cup of sugar, and I didn’t blend it and it came out fine. It melts fast but it’s so yummy:) Thanks so much! Hi there, I really want to make this recipe but I react badly to coconut cream. Could I substitute something almond based for the coconut and still achieve a good ice cream? Thanks! Not yet for this recipe! I made the recipe to the tea but have to admit the flavor was to chocolate rich for my taste. My kids liked it but didn’t love it. Unbelievable!! Made it with 2-70% Theo’s bars and Wild Harvest Organic Coconut Milk – rich and creamy. Might be the best ice cream I’ve ever tasted! Yay! We are so glad you enjoyed it, Kristin! My base is currently chilled in the fridge and is solid! Is that okay? Should I let it warm up to room temp before placing it in the ice cream maker? Others have had this same problem as well, and I recommend letting it thaw a bit before putting it in the ice cream machine! Thank you so much! I am so excited to try it! I used maple syrup and found the consistency to work well. Also, I substituted the water for cold brew coffee, which really enhances the chocolate flavor. Also, coconut cream offers a nice richness and thickness! Enjoy, everyone! Thanks for sharing this recipe, Dana! Whoop! Glad you enjoyed this ice cream, Crista! Hi Dana! I love making your recipes for our family and friends. Our daughter is allergic to milk and eggs so vegan baking is quite helpful. As another commenter noted, the sugar and cocoa powder cup measurements are the same but the grams are different. Which is correct? Thank you! Hi Stacy! The measurements are actually correct since cane sugar weighs more than cacao powder. Hope this helps! Wow! I’m officially vegan now… I had no idea ice cream was so easy to make dairy free! Just finished the Vanilla Bean ice cream recipe and this was a perfect way to make my second flavour. Used 130g of Kirkland Signature semi-sweet chocolate chips (51% cacao) for the dark chocolate and used less sugar. I did taste it after whisking and added a bit more sugar after, but I wanted to be careful not to over sweeten it. Also used the full 400ml of c. cream and did half water half almond milk for the 3/4 cup of water, and it worked great! After reading through people’s difficulties with the thickness, two things that are really important are that the mixture is not too thick and that the bowl should be really really frozen. Yay! Thanks so much for sharing, Matthew! We are glad you enjoyed it. ps. i don’t have the same ice cream maker as you do, perhaps it is not powerful enough? Oh, it shouldn’t be FROZEN before churning. It should be refrigerated! Sorry what i ment was i chilled it in the regural refridgerator but still the base came out very solid..
my ice cream maker arrived on Friday and I made the base on Saturday and got this churning this morning. This chocolate ice cream is incredible, for anyone concerned about tasting coconut, you don’t. I love coconut but I know some people hesitate on some recipes that call for coconut cream. I’ve said it before but I’ll say it again, you are so talented and thank you so much for sharing with all of us!! I made this and it was truly amazing, rich creamy chocolate ice cream with hardly any coconut taste, delicious! I’ve seen a lot of people complaining that it’s not a liquid when it comes out of the fridge but I feel like that is how it’s supposed to be, if mine had been any more liquid I don’t think it would have set properly. My only question is, the ingredients say 2/3 cup of sugar and 2/3 cup of cocoa, but the measurements given in grams are different (133g and 57g respectively) I went by the gram measurements instead of the cup measurements and it turned out perfect, I’m guessing the gram measurements are what should be used, as I also saw someone else commenting that 2/3 cup of cocoa is far too much. End product was delicious, however I found that the consistency of the product after chilling was too thick to be churned in the ice cream maker. I only chilled the product for an hour and it was like a ganache. Coconut fat/oil hardens when cooled, so some hardening is normal, but this was too much. So, this recipe is definitely heavy on the solids, and light on the liquids (water). 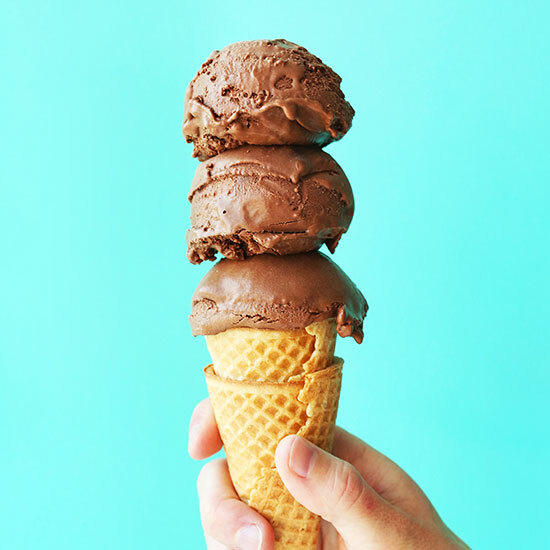 I believe that If you were to increase the water by about 50%, decrease the dark chocolate from 140 grams to 120 grams, and use coconut milk instead of coconut cream, the percentages would come back in line and resemble the composition of premium ice cream and the product should be less viscous and should churn more easily. I may alter the recipe and have another go. Will report back once I get the results! Luke, how did it go?! I’ve made this recipe 3 times and each time it does not turn out right. first round, I don’t believe my ice cream maker base was frozen enough, so it never got “soft-servy” and remained a bit runny. This attempt, however, created a much more “ice creamy” taste than my subsequent attempts. The second round I let the solidified mix hang out and get to room temp before I put it in my ice cream maker. It came out like ganache, really very very sweet and much too rich (no air). Third round, very frozen base and a warm-ish mixture. Let it churn for ~35 minutes and it looks better than my others, but still — not enough air and much too rich. Curious about upping the water content — will this work? I actually ended up designing a recipe that used much less chocolate and subbing in a bit of cashew milk for coconut milk. There is also a seriouseats chocolate vegan recipe ice cream, that is pretty good (only that it melts a bit too fast). 1.) Before placing the ice cream in the machine, it should be pre-chilled to a temperature of 2-4 degrees celsius (no more/no less). Don’t let it hang out until it hits room temperature. The mix should not be warmish before placing into freezer bowl, it needs to be near freezing. 2.) Your ice cream maker needs to be as cold as possible, before you place the mix into it. If you have a compressor machine, leave it on for 10-15 mins before you place the ice cream into the freezing bowl, if you have a bowl that requires freezing, try to get the walls of the bowl to freeze to -15 degrees celsius (or as low as you can). 3. )If you follow the instruction above, your ice cream should churn for a good amount of time before getting stuck (15 mins)…if it gets stuck, try and help it along as much as you can until it hits a temperature of at least -4 to -5 degrees celsius, before you take it out of the ice cream maker. See if these steps help…that said, this is an unusually thick base and it is difficult for home ice cream makers to churn this mix. Let me know. Can I use all of the ingredients and replace the coffee with 1/4 cup of chocolate? Hi Bob! Not sure if you meant replacing the chocolate with coffee? We haven’t tried it, but if you do let us know how it goes! I’m excitedly waiting to try this. My base is in the refrigerator as I am typing. I couldn’t let what was left in the bullet go to waste after finger tasting it so I put some almond milk in the bullet and got every bit of the chocolate that was in it. I read where some said they put the base in the freezer and some in the fridge. Which was it supposed to be? I really hope my ice cream will come out as it is supposed to. I will let you know tomorrow when the base is cold and ready for the final spin. Hi! I would put it in the fridge! I just put my pudding like base in the ice cream maker to churn. This is amazing Dana. The recipe was so simple that I questioned if it would work for me. It is definitely creamy, has a lot of chocolate flavor and was fun to make. Chocolate ice cream is my husband’s favorite. I can’t wait for him to try it. I put it in a quart size tovolo tub for freezing. I have to say, I could not let what was frozen in the base of the maker go to waste so I managed to scrap every part of the ice cream off with a rubber spatula. One this is for sure, it is to early in the morning for me to be eating ice cream. This was my sample run before Thanksgiving. My goal is to make everybody’s favorite flavor of ice cream healthier. Thanks Dana! This was fantastic. I look forward to making a few of your other dessert recipes. I’m sorry, I was so excited and quick to hit the send button I forgot to rate the recipe. It definitely is a 5 star *****, 1 for ease of making, 1 for prep time, 3 for flavor, flavor flavorful taset. I honestly think this is the most delicious thing I have ever made! Thank you! Hey! Exceptional statement! I adore the way you described Vegan Chocolate Ice Cream . An additional outstanding review starting from useful publisher. to read the paper customers articles. Too bad I’m not really that fantastic at developing, specifically in instructional simply writing. That’s exactlyI usually invest in document by means of several formulating people . I made this recipe last night and it seems to me the ratio is off. As many others have said I let the base cool and it was absolutely the wrong texture. So I added another can (400mL) of coconut milk and now it’s perfect. I made this today but used coconut sugar instead of regular sugar, I also only chilled it for an hour or so before churning because I was afraid it would be too solid for my ice cream maker to handle if I left it in there overnight. This was my first time trying out a coconut cream ice cream recipe, but it froze up nicely in the same amount of time my regular ice cream does. I put it in the freezer to harden, and tasted it a few minutes ago. Very satisfying. The coconut sugar makes it mellow, not as “sugar bomb” tasting– but the rich chocolate taste is on point! When I chilled the base in the fridge overnight, it turned totally solid. It might have been because of the chocolate that I used. But, I left the base on the counter for four hours before poring it into the machine. It was still very hard, but I was able to scoop it in the machine. I used Hershey’s special dark cocoa powder, and the color was dark, dark brown. 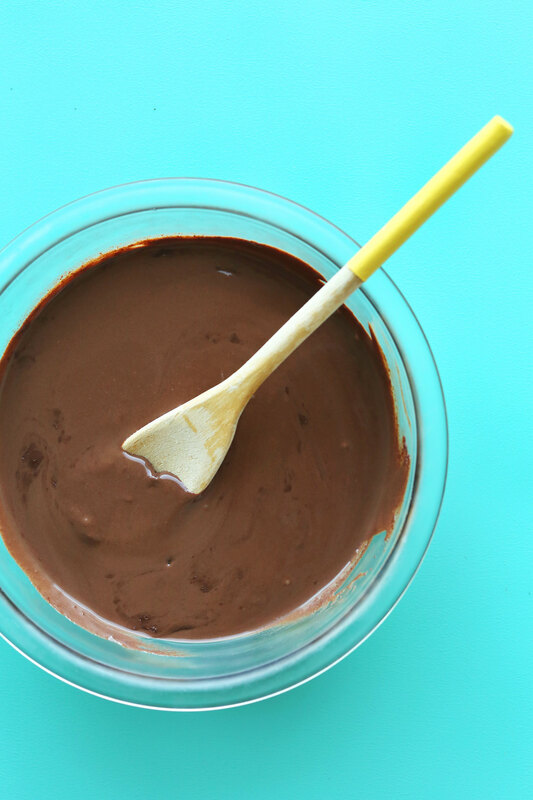 I kept some of the chilled base, and it works well as a chocolate sauce or hot fudge dip. I heated it up a bit until it was runny, added it to a blender with almond milk (Dana’s recipe), added a few ice cubes, and made my 5 year old cold, frothy, “chocolate milk” which blew her mind. This is definitely worth making and can’t wait to try it again! Aloha! I made this ice cream base yesterday and put it in the refrigerator over night.when I took it out it was so thick I couldn’t pour it into the ice cream maker..I added coconut milk to thin it out but it did”nt help at all..had to scrape it out and dump it..what went wrong? All the sorbet works great, but this was a mess! Was looking forward to chocolate tonight! The only thing I think would have saved it is if I had put it in to the ice cream maker after it had cooled bait and not overnight. Hi! Hmm, it should be pretty thick! But not that thick….Did you melt it all properly? The chocolate mix had such a beautiful velvety texture to it after being chilled overnight that it took all the willpower in the world to actually make it to the machine lol. But when it did, my oh my. This recipe is absolutely fantastic. Best. Ice cream. Ever. Quote from the hubs, “this is like Hagen Daz”. We aren’t dairy free (we just limit it), so I used Guittard milk choc chips in place of the dark chocolate and it was incredible!! Making it again next week for extended family dinner! They’re going to love me! Hi Dana – I hope I’m not getting in on this conversation too late. I haven’t made it yet but I am convinced given your high standards. I know you have already commented about this but my biggest issue that I need to get past – even bigger than creaminess – is the sugar factor. As it turns out, sugar is a much bigger toxin than most people know about, given the latest research, and is actually at the bottom of a lot of conditions and diseases that people aren’t aware of. It is especially toxic for people with conditions like heart disease which is my most immediate problem besides diabetes and other things. I think I will try it with Monk Sugar or anything else, maybe Stevia, with a low glycemic index. It tastes amazing! However it was so thick after chilling it in the fridge overnight that my kitchenaid icecream bowl couldn’t handle it. Looks delish! Can you put a link to the chocolate you use? Hmmm. Well I must admit, I did not chill the base overnight. I used it at room temperature – though I have made fruit “ice cream” base at room temperature, and my machine did it justice. There’s nothing in this recipe that would thicken it in the frig, no? I churned this sucker for 1.5 hours – it NEVER got close to an ice cream or gelato or sorbet consistency. It poured like liquid chocolate. It came out the same way it went in, just colder. I put the mixture into an ice cream tub and am hoping a deep freeze overnight will turn this into something that resembles “ice cream” and NOT liquid chocolate. I have pre made simple syrup already made – 1 to 1 ratio – how much should I use? Thanks! Yuk! Tasted like chocolate chalk. I knew 2/3 cups of cocoa would be way too much. 1/3 at most. Delicious. Some of the best chocolate ice cream I’ve ever had. I think I’ll get there with some more practice! Thank you so much for showing me how great vegan food can be! A can of coconut milk is 1 3/4 cups. Wondering why you didn’t use a whole can. I’m going to increase everything x 1.4 but I’m worried that you did this for a good reason and I’m going to regret my decision! I just made this and it’s delicious! Thanks for the recipe. I used agave syrup instead of sugar as that’s all I had in the house. Also substituted almond extract for the vanilla, but I should have used less as it’s a bit strong. I’ll definitely make this again and experiment with other flavors. Hi Clayton! I haven’t test it but its worth a try! Hi! Do you think I can use xylitol instead of the cane sugar? I’m sure it won’t be the same thing but do you think it will make too much difference? Thanks! I love your recipes! I made the salted caramel coconut ice cream yesterday and it was a complete success! I’ll try all your ice cream recipes now! Hi Esther! We haven’t tried it, but if you check the comments above, others had success that substitution! Made this last night. For the coconut milk I used Trader Joe’s organic coconut cream. After cooking the base and adding the chopped dark chocolate and vanilla, I mixed it through the vitamix. I was short on time so instead of refrigerating the base, I whisked it over an ice water bath to cool. I then churned it in my ice cream maker. It turned out creamy, rich, and decadently dark. Absolutely delicious! I think the dark chocolate overtakes the coconut flavor for those who aren’t big coconut fans. My favorite vegan recipe to date. Thank you! Hmm, it should be pretty thick! But not that thick….Did you melt it all properly? I had this same problem. Came out of the refrigerator like a ganache. Followed all directions properly. Wonderful recipe! I wonder if I can substitute chopped chocolate for more cocoa and change the quantity of something for a good result. I’m crazy to do it! I’m waiting for the answer. In the last couple years when I google ingredients for a recipe, the minimalist baker pops up towards the top. I have tried many of your recipes and am always impressed by their simplicity, healthfulness, and tastiness! I am excited to try this. So odd! Make sure your freezer is super cold! And set it in the back and cover it with foil. Hi! 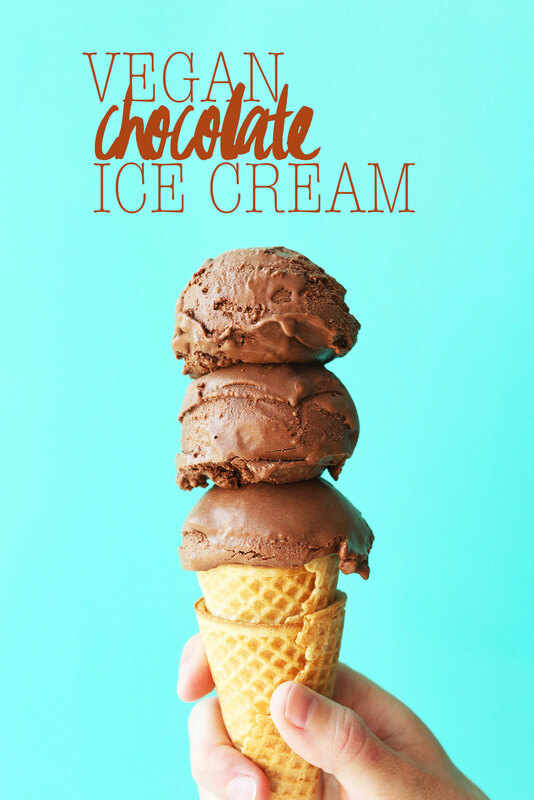 This recipe inspired me to buy an ice cream maker, which I plan on using with this recipe. Was wondering how mix-ins work with a recipe like this? Like nuts, chopped pretzels, etc. Would I mix it in after its done churning? Because of blood sugar issues, I substituted the cane sugar with xylitol for my birthday celebration. The ice cream was amazingly tasty, but everyone had some significant gastrointestinal issues. I would love to hear some alternatives others have used. Thanks so much! Really like this ice cream recipe to try. I’m a diabetic, so was wondering it I could use a granulated sweetner like Splenda in the place of the sugar? You can try a natural sweetener such as Stevia, althought I haven’t tried it myself and can’t guarantee the results. I wouldn’t recommend Splenda as it’s not great for our digestive system. just found this recipe and made it – I used Swerve- and it came out great! my husband did not realise I used a sugar subsitute! It is very chocolatey! Thank you, next om my list is the vanilla bean recipe.! Yummmm. Perfect timing. We’ve been using a friend’s ice cream maker all summer and I’ve been wanting to try some dairy-free recipes. This one will go straight to the top of the list! I might try adding some peanut butter swirls to it just because peanut butter and chocolate. Is there a way to make ice cream without an ice cream maker but will still have the same texture? If I mixed it for more time every hour or half an hour, will it taste the same as if I freeze it and mix once an hour for a small amount of time or will it taste better than that? I was wondering how dark your dark chocolate is – 70%? 80%? 88%? I love dark chocolate but don’t want this to come out too bitter…what did you use? The only dark chocolate I had was Baker’s Unsweetened. 5 oz finely chopped made 1 1/4 cups. I left it overnight in the fridge and it is as thick as ganache. Should it be thick enough to form balls? And not quite sweet enough. I thought I would add another can of coconut mild and 2/3 cup of sugar (heated to dissolve the sugar). I made this ice cream for Father’s Day for my hubby who really knows his ice cream. He took one taste, and WOW his eyes got as big as saucers and gave it two thumbs up! He had no clue it was dairy free. It was decadent, silky smooth and sinfully chocolatey! It really helped create the velvety perfect texture by pulsing it in my Ninja blender. No ice crystals in this recipe! Left it in the Ninja container to cool in the fridge and transferred to my ice cream maker. I used the dark chocolate chips from Whole Foods….really was a great chocolate to use. Will definitely be using this recipe again! Dana, you are a culinary genius! Looking forward to seeing more ice cream recipes in the future! Lovely! Thanks for sharing, Suzanne! I tried this with some modifications. I replaced water with chocolate flavored soy bean milk in smaller amt and only added Coco powder, skipping the heat as well. I love the taste and texture! :) But some may find it too thick? I experienced slight indigestion, not sure if it’s from not boiling the coconut milk. Anyone can advise me? Thanks for all the great recipes! I made the base and put it in my freezer overnight, but now it is too solid for my ice cream maker (I have the same kind as you) to churn. Perhaps was my fridge too cold? Should I just let it thaw out a little bit? Hmm, I’m not sure but if you give it a try, let us know how it goes! I cannot wait to try this. Before I changed my lifestyle, I used to eat chocolate ice cream religiously. Thanks for posting so frequently btw, you’re a MACHINE. I have one recipe request for you that is generally already vegan and one of my favorite things to eat in the world. I know you love Asian food and since I’m half Thai I share that love with you. Have you ever tried Ban Xeo? It’s a Vietnamese savory yellow pancake (made with turmeric which I know you’re loving lately) that’s perfectly crispy and stuffed full of anything you want really – tofu, bean sprouts, veggies. Then you can wrap it in a lettuce leaf and top it with basil, cilantro, and mint, and dip it in some sauce (traditionally a fish sauce mixture but I know you’ve got a solution for that). :) Or instead of a lettuce leaf, you can use a fresh spring roll wrapper and roll it up and dip it in some sauce. SO GOOD, I’m obsessed. If you haven’t tried it, I promise you that you’ll love it. And if you posted a recipe for it I would be SO pumped. THANK YOU again for making it so easy for people like me who work all day to come home and make something delicious and easy and guilt-free. You’re the best. Thanks for the kind words! I haven’t tried or heard of Ban Xeo. I’ll add it to my list!! I’ve made the golden ice cream and tried this one but didn’t leave the bowl in the freezer long enough.. so it wasn’t the right consistency, although it was still amazing and I could hardly taste the coconut! Hey Dana! Just curious why didn’t you use cashews in this recipe like you do in a lot of your others? Did it cut back on the chocolate richness (perhaps attempt #1?)? I think it adds too much of a cashew flavor to chocolate ice cream! This actually sounds really delicious considering it’s vegan! Hi Dana! Nice to meet you! On my blog, there aren’t all recipe for lactose intolerants, but I’m working to change all my diet. This was the BEST ice cream! Was…because it’s almost gone. I used Trader Joes coconut cream and it is so creamy compared to using just the coconut milk. Once it was cooled in the fridge it was like pudding so it was a challenge getting every last drop in the ice cream maker. My husband loved it! The best chocolate fudge ice cream! Thank you for creating it! This is the best chocolate ice cream!! Came out perfect…it almost didn’t make it into the ice cream maker because it’s like pudding after chilling in the refrigerator overnight….5 stars!!! Vegan ice cream with coconut cream is THE BEST. Some flavors are even better than regular ice cream. This looks amazing! I wish I had an ice cream maker. 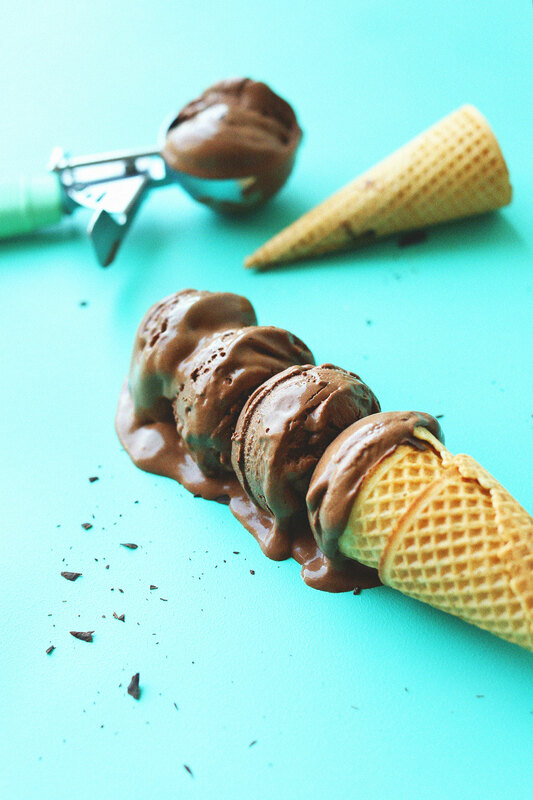 I just loved vegan chocolate ice cream, it is looking so appetizing, looking forward try this. This looks unbelievable! Apart from banana ice cream, I’ve never made my own ice cream but I absolutely have to try this recipe! I love everything about it . . . you sold me at the description that it was between ice cream and gelato! I think I will buy an Ice cream maker very soon. Loved your recipe. A tip if you dont have an ice cream maker and are lazy. Just freeze a pan of ice cream. When its solid, take it out, cut it into smaler pieces with a knife. Put the pieces into a food processor and blend untill smooth. Put it back into the pan and into the freezer for some hours. Voila! Fluffy ice cream. Do you chill I’ve the frig OR freezer overnite?? Do you chill in the frig OR freezer overnite? In the freezer….. My didn’t turn out to be so creamy coz I don’t have an ice cream maker but it tastes really very good….?????? YES, this recipe looks INSANELY CREAMY! I love the decadence of each scoop on the cone. YUM! With every ice cream recipe you post I get closer and closer to splurging on an ice cream maker. It looks so melty and marvelous!! YOU MUST! so worth it! As a breast cancer survivor I’m trying to avoid hormones in milk and find a dairy-free ice cream I like, but I hate the taste of coconut. The Trader Joe’s brand I tried had a good mouthfeel, but I couldn’t get over the coconut taste. By any chance, is the coconut flavor in this recipe drowned out by the large amounts of chocolate? Or should I just try David’s sorbet? (OK, I realize this likely a silly question, but I’m mostly just hopeful.) Thanks for any input! I love your website. Give David’s a try if you’re not into coconut, although I WILL say that the coconut isn’t overwhelming in this recipe, the chocolate is the star! Me too! I am also a BC survivor and have gone vegan.. My doctor just said “good!” He is glad! YAY to DANA!! You have gotten me to love to cook again!!! I hated it and wasn’t cooking as much and spending too much money (that I didn’t have) so this brought me back to the basics and really the costs of the items to make these delicious foods isn’t very much!! THANKS DANA!!!!! Yours is the BEST BLOG I have ever run across!! This looks delicious, and I might have to try it (especially since I am going thru a “vegan” faze at the moment). I wish I had an ice cream maker! I have my bowl in the freezer :) I just need to run out and get some dark chocolate. I can already tell this recipe is going to be a winner. As soon as I saw it, I started thinking of using it as a starting point to making banana ice cream. Having a pre-chilled bowl in the freezer makes the ice cream chill faster preventing ice crystals and denser product. My bowl stays in my deep freezer because I hardly ever use it. Gr8 recipe…. But why do u put an empty bowl in the freezer??? Not “an empty bowl”. It is the churning bowl part of the ice cream maker. It’s the key step to using the ice cream maker. This looks so amazing! This is exactly what I have been looking back for. I wish I could sub the cane sugar, though – I don’t eat sugar. Do you use a machine to churn this? You could try maple syrup! I used the maker linked above. So you rec a vegan cocholate bar or unsweetened baking chocolate ?? I haven’t, but that’s a good suggestion! In general I just think I’m off dairy products – they never served my body! So glad that you tested this recipe 3 times so we don’t have to! I think the true test of a chocolate recipe is tasting it with your eyes closed. I find I’m so visually influenced by the colour/appearance with chocolate foods that I trick myself into tasting it–even if it isn’t that strong. This ice cream totally looks like it would hit the mark though ;) xo! I agree ~ my mom thanks you cause she’s the one I would have gotten on this project. Honestly, I wouldn’t have thought you could have made vegan ice cream that looks this creamy with that ingredient list. Pretty impressive! !